Description: Located in Summit County, Colorado within 10-20 minutes of Breckenridge, Keystone, Copper Mountain, Arapahoe Basin, and Loveland ski areas, this luxury condominium unit provides access to some of the greatest downhill skiing in the world along with a host of other winter and summer activities. The Vail and Beaver Creek ski areas are a slightly longer drive, but readily accessible for a day of skiing. You can easily ski a different area every day of your week long stay in Summit County. Access to the Summit County ski areas and the regional cities of Silverthorne, Frisco, Breckenridge, Dillon, and Keystone is provided FREE of charge by the Summit Stage shuttle bus that stops across the street from our complex. One of the leading summer vacation areas in Colorado, this area offers a wide range of golfing, hiking, fishing, water sports, and other activities as well. Rocky Mountain National Park is an easy one-day round trip visit in the summer. For the bargain hunters, the Silverthorne Factory Outlet center is located at the base of the mountain, only minutes away. 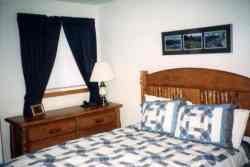 Our unit, newly built and completely furnished in 1999, is on the slope of Buffalo Mountain, at the top of the Wildernest development in Silverthorne. You will enjoy spectacular views of the mountain ranges and Lake Dillon from our balcony deck, with Buffalo Mountain and Arapaho National Forest views out the front. Miles of cross-country ski trails, snowshoeing, and hiking trails are literally across the street from the condominium complex. 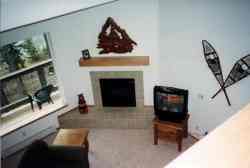 Our guests have full use of the Gore Trail complex's clubhouse including the two hot tubs. 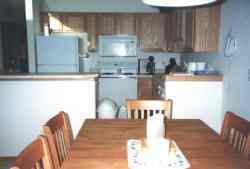 The three bedroom (2 Main w/Queen Sized Beds and large Loft w/2 Single beds)unit has three full baths, full kitchen, dining room, and living room with gas fireplace along with washer and dryer in the condominium. There is a Queen Sized sleeper sofa in the living room. Covered parking is provided. 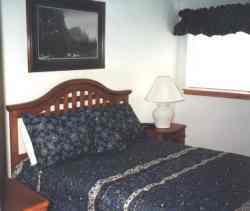 Amenities: Fireplace, Phone, Cable TV, VCR, Microwave, Dishwasher, Full kitchen, Washer, Dryer, No pets allowed, Linens provided, Cookware and utensils provided, Gas BBQ, Covered parking, Clubhouse with hot tubs, Deck with great views. Activities: Skiing at its best, snow shoeing, hiking, sledding, sleigh rides, summer swimming & sailing, championship golf, river rafting, horseback riding, mountain biking, historic Colorado drives and adventures. Area: We are 1 hour from Denver and 1.5 hours from the Denver Airport, 2 hours from Colorado Springs and the Air Force Academy. Silverthorne, the city where we are located has a large discount outlet shopping area. Restaurant choice is almost unlimited. Check the Summit Daily News, a local free daily paper for the many events and frequent 2 for 1 dinner specials at local restaurants. Please - No Smoking and No Pets allowed.